You can follow me on Facebook, Pinterest, Twitter, Google+, and Instagram. Paul: Welcome to the Cincinnati and Northern Kentucky Real Estate Podcast, hosted by myself, Paul Sian, realtor with HER Realtors, licensed in the state of Ohio and Kentucky. I’d like to welcome my guest today from Good Eye Home Inspections, Todd Engle. His website is goodeyeinspections.com. Todd, how’re you doing today? Todd: Doing awesome. Thank you for the invite, Paul. Paul: Thank you for being on this very first podcast of mine. It’s something I hope to do every month. And I have in mind to have great experts like you out here. So why don’t we start, and I’d like you to tell me what is the training for a home inspector? Todd: Well, there are many avenues and opportunities for training and getting into the business. Mine was the School of Hard Knocks, buying and selling and flipping homes approximately 23 in the last 10 years. But I did become a certified professional inspector through InterNACHI. InterNACHI is the International Society of Certified Home Inspectors. They’re the only organization that’s truly recognized by most of the 23 states that require licensing for home inspectors. I got into the business because I love homes and I love taking care of people. Paul: What kind of training does that involve? Is there a couple of months’ worth of training? Are there hour requirements? Todd: Good question. You can pretty much do either all online training to learn that part of it. But the true training can come through schools where you spend a week in a school. But you still have to do continuing education every year and pass certain tests through InterNACHI to even stay with them as a member. Paul: Okay. And how long have you been inspecting homes? 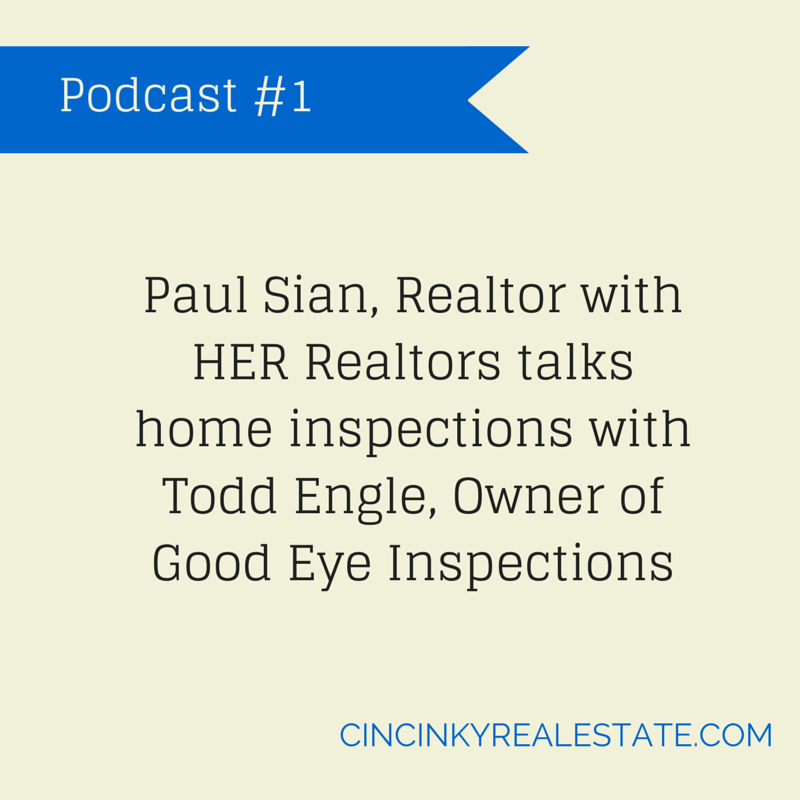 Paul: Can you describe the typical home inspection process? A home buyer comes to you and says, “I’m preparing to buy this home. Can you inspect it for us?” What do you do after that? Todd: Basically talk to the client, obviously gather some information. Ask him if there are any concerns that they saw when they were at the house themselves. Most people will point out one or two things or notice something that they saw on the seller disclosure about a previous leak in a bathroom, leak in the ceiling, age of the roof. So kind of feel them out about that and their major concerns right off the bat. And then I’ll send them a sample inspection report of my previous work so it can show them how detailed we get. Paul: Okay. And when you’re going through inspections, are there some common ones that you normally find, common issues? Todd: Yes, there are usually always electrical issues, whether it’s inside the main electrical panel or outlets and receptacles that are on the floor, kitchen, any kind of outlet or receptacle that is not wired correctly, possibly an open ground or what’s called reverse polarity, which could be a fire hazard. But most of the time, it’s inside the electrical panel. And even though the house may be new or 10 years old, somebody has probably been inside that panel and done something wrong at one time. I won’t say always, but half the time, we’ll find leaks underneath the sinks. Those will be the two big common things. Paul: Okay. And what’s the inspection like for an HVAC system, your heating and cooling? What is involved in that? How do you do that? Todd: Those are pretty general. We don’t take apart or dismantle the furnace or the air conditioning unit. We’re looking for some major things on the outside of an air conditioning unit. Not being level. The suction line, which is the black foam part behind there is usually always rotted off and not in good condition. That needs to be full and in good condition. And on the furnace, whether it’s heating the home properly, we do temperature readings from the vents and the registers. And there should be what’s called a good temperature differential of 20 degrees or less between the farthest return to the farthest register. It should be between 15 and 20 degrees. We will take off the main panel of gas and electric furnaces just to look inside and see if there’s any corrosion, frayed or burnt wires. Common thing I see at the bottom of some furnaces is there’s an emergency shutoff switch that if you dismantle the bottom panel of the furnace, emergency shutoff should be shut off to shut the whole system down. Some people take that unit up. Well, what if your children are down there playing in the basement and they pull the panel off and stick their hand in the air handler? It’s going to hurt. Paul: Okay. I’ve had an issue in a past inspection where I was the seller’s agent and there was an issue in the garage door. Basically garage door pressure versus what this inspector stated was an issue. How do you inspect a garage door? And tell us about the garage door openers. Todd: On a garage door, that would be the auto reverse. That’s been require since, I believe, 1992. And it should not be any higher than 8 inches off the floor, and it should not be totally on the floor. And it should not be attached to the ceiling, unless you have a 9-foot child. I’ve seen them attached to the ceilings. Somebody just not put them there correctly. But those auto-reverse sensors have killed children in the past. That should be installed on each side of the garage door. And it basically has a sensor, and it senses movement in the area, and it reverses the garage door. Some other things we look at on the garage doors will be the chain. If there is a chain, sometimes there’s a huge flack in the chain. It’s loose. And also bolts in the ceiling come loose. You may remember Erector Sets. Certain kids remember that or certain adults. In Erector Sets, if you don’t tighten those bolts tight enough, they’ll fall apart just like garage door coming out of ceiling. These are some of the three big issues to look at on garage doors. Paul: And what do you recommend for the average homeowner to maintain their HVAC? Just if they need to do something on their own, like changing the air filter is a common thing. Is there something that you would suggest to homeowners that they can do? Todd: Definitely, mark yourself a calendar. Whether you’re old-school and use a calendar or a smartphone, put a reminder in your phone to check your furnace filter monthly, minimum 90 days. Not recommended at all using a thick, expensive furnace filter because they actually can hurt your unit, slow it down. I recommend every client what’s called an eco-friendly filter. They’re about $20, but I’ve had mine for 12 years and never had to replace it. You do have to take it out and clean it and then put it back after it dries. But an eco-friendly filter is the best one to use, I believe. Paul: Okay. And then for garage doors, similarly, regular tune-ups. Todd: Good question there. They have an Alum-a-Lub. Depending on your tracks, some people use Alum-a-Lub or WD-40. Squirt it in there maybe every four months. It helps keep the track run smoothly. Paul: Okay, that’s very good advice. Why don’t you tell us about termite inspection? Is that something you do? What’s done with the termite inspection? How do you deserve termite activity? Todd: I don’t personally do termite inspections. We have an outside company that we hired to take care of that. There’s a license that the termite company has to have. This is 100 percent mandatory and required because of the chemicals that they use. We always subcontract that out. Or if the client wants to choose somebody of their own, that’s their option. I usually find termite tunnels before the termite inspector gets there. They look like the size of a pencil. They are brown. They run up from the ground or mostly up inside joist or any kind of wood contact. Big thing with termites, in Cincinnati, there are a lot of them. And we find them on condos and a lot of homes, I would say about 30 percent. What you want to do is make sure that termites are not brought in from the mulch you buy at the store. Or you buy big mulch. They can be brought in from mulch truck. And then you don’t even know you dumped termites on your own property that used to be clean. So it is very common, but it can be treated. Paul: Okay. And how do you determine the extent of damage that termites do? Is there some visual inspection? Todd: Yeah, visual and take a screwdriver and stick it in the wood. We will not damage anything while we’re at the property. But if we see a tunnel, we’ll check the extent of that tunnel by just taking a screwdriver and testing the wood or the wood source around it. I have actually used my hand and tapped on the floor joist and put my hand all the way through the floor joist. So they rot or extend to the wood. It can be very bad. Most of the time, it’s not. So people always freak out of termites. Remember, buy treated mulch. Paul: And what’s a good way to treat the termites if they are there? Presumably, if the wood is rotted, that’s just a matter of cutting it out, replacing it if possible. But how do you treat the actual infestation? Todd: There is a chemical. And again, you have to check with a licensed termite company that has a termite license to treat the home. I believe it’s called Termidor. It is a chemical that’s approved by the government. That is drilled into the home’s foundation like every 12 or so inches. The chemical is pumped into the home, and it creates a barrier around the home. Termite treatment used to be guaranteed for life a long time ago, but government outlawed the chemical called chlordane, which is no longer used today. But usually, I believe the termite companies give a 2 or 3-year guarantee on the termite treatment. I would highly recommend if you have termites in the home, do an extended warranty on the home because it does wear out over time. Paul: Okay. Can you tell me about radon inspections? Todd: Radon is another thing that’s a very specialized field, and it’s kind of out of the realm of the home inspection. But there are good radon companies in Cincinnati. I recommend hiring someone and spending $140 or so on a radon inspection. They use a true machine, and they put it inside the house for 24 hours. In the house, all the windows and doors need to stay shut as much as possible for the machine to do its job. And radon is a gas that is very common in the area. It seeps through envelope of the inside of your home. According to the government, it does cause lung cancer over an extended period of time. I believe it’s called piculars. Anything over four is recommended. And as far as having your home mitigated, the mitigation system is basically a huge 4-inch PVC pipe that is drilled in the basement floor with a motor that pulls the gas out of the house and pushes it outside into the air. Paul: Okay. It’s not something that is going to… You’ve got radon now and suddenly, your house is no longer sellable. Todd: Right. Now it’s a bit of a hot button lately with a lot of health-conscious people over the years. I would say 50 percent of the people… no, it’s less than 50 percent that get the radon test. It comes down to financial expense. Most radon companies charge $140 or $160. My client’s is $135. We get a little bit of a discount on that if they want it. But when they’re already spending money for an appraisal on a termite inspection, a home inspection, you add on the radon. Some people just weigh that option. But it is becoming very popular. It’s not a deal killer if somebody is buying your house because then if you don’t have it, they can opt out or opt in to get the radon testing done. Paul: Yeah. And just to clarify, the $140, $160 quoted, that’s more for the Cincinnati area. They vary from state to state. And not every state has as much radon issue as we have over here. Todd: Correct. And if you were concerned with radon, EPA has a website that you can go to. Just Google EPA radon. It’ll take you right to the EPA’s website. And you can pull up a map of the United States and narrow it down to your area to show where the levels are heavily concentrated. Paul: That’s great. That’s good information for people to know. Let’s move on from radon. Let’s talk about home inspection and how a seller can get ready. Todd: I love that question. Paul: They’re probably a little hesitant to have the home inspector in there, but at the same time too, they want their deal to get completed. What’s the best way for them to get out of the way, so to speak, and help you do your job? Todd: That’s a great, great question. Big things would be light bulbs. I know that sounds very petty, but if I see a light bulb that’s out… For instance, this morning in a condo downtown in Cincinnati, there was a chandelier above the dining table that had five lights. Two light bulbs were out. I could’ve assumed that the light bulbs were just out. I took one out, tested the fixture, and it was the fixture in that area. So just don’t let a home inspector assume. Just change all your light bulbs, because what if that’s the only thing wrong with your house and the home inspector says I need an electrician to go out there? That’s going to cost you $100 from them to show up at the door. You could’ve just changed a couple of light bulbs. Getting the home ready. Make sure that your attic access is accessible. It’s not painted shut or sealed shut with screws. Make sure the electrical panel is accessible or you can take the panel off. Very common in the area, people finishing their basements, and then they box in the electrical panel with a kind of mitre picture box frame looking thing. You can’t even take off the electrical panel. We’re not paid to sit there and dismantle your home take the stuff apart, so make sure everything is accessible – especially the closets. Everybody has a lot of clutter. Empty out your closets so we can see behind walls and stuff like that, because certain home inspectors will dig and move stuff, certain ones won’t. I prefer the ones that dig and get a little dirty, just to find that extra little bit. But the big things, again, light bulbs, making sure the attic is accessible, and the electrical panel is accessible. And it doesn’t hurt. We’re not out there to check for dust bunnies, but it doesn’t hurt to clean your house and get it ready and make it look presentable. That really does have an impression and it helps. Paul: Okay, that’s all good advice. We talked earlier about buyers having concerns about the house that they’ve seen. Is there anything the buyer needs to do to get ready for the inspection? Todd: Show up with a check. No, just kidding. That’s a good question also. I personally, in my career of real estate in the last 15 years, every time I’ve ever bought, I wanted to know the lay of the land, where my markings were, how wide my lot was. There are many websites out there. Or you can get it from the county. Go directly to the county, for instance Clermont County Auditor. Search real estate. You can look up a lot of information on your home ahead of time. You want to know your square footage when the house was built. Big thing for buyers is get a copy of the seller disclosure which lists any issues that the seller knew about the property: age of the roof, age of the furnace, age of the water heater. Sometimes they know, sometimes they do not. Those two things right there would be the biggest things. I highly encourage every client to show up to the inspection for at least a minimum of one hour. Some people, “Well, I’m fine. I don’t need to be there. I’ll just send you a check.” Are you kidding me? I treat inspection as an education too because when you’re there, I will show you everything inside and out about the home that I found, but also teach you tricks about home, to take care of it, preventative maintenance. And if you don’t fix this down the road… Let’s say the seller doesn’t fix it and you need to fix it immediately so that future issues don’t happen. Paul: That’s good advice too. Sellers should come to get education. For you personally, once the buyers are done with the inspection, they buy the house. Are you available to them afterwards if they had a question or something? Todd: Yes, and I advertise that on my website. It’s called Inspector for Life. This is not a hey, Todd is going to be here a year or two because there’s a lot of turnover with home inspectors. I am here for a long time, at least 18 years in Cincinnati until my wife and I move to Florida or North Carolina to chill on the beach. Todd: But on my website, Inspector for Life, what that means for you is if you’re available to me six months down the road the day you move in, two years later, I want to know if you have a problem or an issue about something not really with my own inspection because you won’t. But Todd, I now have bats underneath my deck. What do I do? Well, bats are now certain protected species. You can’t just go out there and kill them. There are pest control companies, a very few in the area, that are licensed to take care of bats. Or Todd, I want to put a deck on my house. Can you help me out with the right contractor? Yes, I can. That is a free service. It’s kind of like Cincinnati’s Angie's List. I’m part of a network of 200 people in Cincinnati that are most trusted vendors, and I could hook you up with anybody. So that’s kind of what my Inspector for Life thing is on my website. Paul: Let’s talk about having an inspection prior to listing your home for sale. I wrote this on a couple of my blog posts. And I know realtors around the U.S. that usually recommend to sellers get a home inspection prior to listing. What are the advantages for a seller to do that? Todd: Every bit of dollar you spend on getting a pre-listing inspection is well worth it. Many, many reasons why. If you’ve been in a home, I would say, over 2 or 5 years – especially if you’ve been in a home for 10 or 20 – that is a must, non-negotiable. I have an example for you. It happened here in Anderson. A guy had been living in a house for 36 years. He had boxed in his electrical panel in the basement, not to hide it. He wasn’t hiding anything, just cosmetic. I opened up the door, and it was 6 feet by 2 feet of mold all over the panel. He had moisture intrusion from a small crack on the outside of his basement. It caused a leak. All of the breakers were rusty inside the panel. A lot of issues there. Number one, the house could’ve burned down that day. Number two, all the mold. So we caught it. And the guy had to spend a little over $1200 to get a whole new panel, get all the mold cleaned up, saved his documents, because the right thing to do is save those documents. He was aware of the issue. Present those to the new seller, and move on. Now let’s say he didn’t get an inspection. Do you think he could’ve sold his house? Paul: No, that would’ve been a big deal-killer right there. Todd: Exactly. So pre-listing inspections are huge. They’re the responsible and right thing to do. And for selling your product, which is your house, but also it can for the seller. And while this is such a great investment, it can get rid of a lot of back-and-forth negotiations between the agents. A lot of bickering is ended because I have home inspection. It was done right. We fixed everything. Here’s the invoice, and we fixed it. Here’s my price. Paul: It saves the seller time and money as well. Todd: Yes. Now if you’re buying a house, you and wife go to get a house. And oh, they already had an inspection. Get another one, because you don’t know if that inspector is the person’s brother, sister, cousin, friend. Don’t assume that they got a free and fair inspection and then you’re good. Get one to cover your own assets. Paul: Yeah, just double-check. Okay, it’s good information. Would you recommend a home inspection for new construction? Would you recommend that? Or should we trust the builder? Todd: No, this is hilarious. I love it. Well, you should trust your builder. There are a lot of great builders in Cincinnati. What I see personally, we just did one on Wednesday in Mason. And it was a $500,000 home. And there were two gas leaks, one of them on the outside. Meters installed by Duke or whatever the provider was. I’m not sure. But the inside, there was a leak at the furnace, gas leak. And then the roof, the second story back section of the entire roof needed to be replaced. The guy was closing in two days. What happened with this situation, all the shingles in about 7 of 10 of the layers were all destroyed from them adding siding after the roof was installed. Whatever boots or shoes these guys were wearing tore almost all the granules off of the shingles. So right there, bingo. Another one I had in South Lebanon last year. The buyer had a very nice master bathroom. $700,000 house, and the subway tile on one wall did not match the other subway tile on the backsplash where the Jacuzzi was. And I just pointed it out asked if they didn’t even notice. The color was off a little bit. But all the tile had to be removed, because his wife said, “No it has to match.” So very rarely do we find a lot of stuff with new construction, but when we do, it’s usually something very major to the client. Paul: Yeah, it makes sense. Not necessarily just in the high-value homes, but even a $200,000-$300,000 new home, the client gets the benefit by having a home inspection. It’s just a second neutral party come there and look through everything. Todd: Yup. And especially if you have bought a new home… And I think I did 260 inspections in the last 12 months, and I think 5 of those were new construction. Red flag there because I know they’ve built way more homes in Cincinnati than that. But if it comes down to like your 11th month, we have something called an 11th month inspection. They’ll say you have a one-year warranty for the builder. They’ll fix anything within the first year. Call me at your 10th or 11th month. Paul: That’s a great feature right there and great service right there because I’ve purchased a new construction and I’ve had that issue too, the 10th or 11th month. It was an obvious issue. The siding started falling off and flapping in the wind. But that’s an easier thing to see. But it would’ve been great to have a second eye coming there and look through the house and hey, you need to have this fixed or have that fixed. That’s very good advice. Thank you, Todd. That was Todd Engle from Good Eye Inspections. And my name is Paul Sian with HER Realtors. Hope you enjoyed the podcast. And if you have any questions, feel free to shoot me an email. I’ll have information in the podcast links. We’d like to hear from you. Thank you again for listening. About the author: The above Podcast about “Home Inspection” was provided by Paul Sian. Paul can be reached at paul.sian@herrealtors.com or by phone at 513-560-8002. With over 10+ years experience, if you’re thinking of selling or buying, I would love to share my marketing knowledge and expertise.